The words, first, like cherries. Not bent to, not leaning into to form association. Not to assert not-quite. Cherries have not-quite to do with girls. Beyond a square in a circle, beyond a circle in its outer circle: echo. Voices. Five girls not-quite a circle, not-quite pillar or prostrate—their ideologies angled towards, not-quite directed. Not-quite directive. Sweeps right arm, long, across chest, pulls hair of other. Massages neck with hand, then shoulder with knee. Mouth to arm. Embrace. To understand joint, one must. To understand, one must bring cherries a little late. For those awaiting a follow-up to her debut, Wide slumber for lepidopterists (Toronto ON: Coach House Books, 2006), rawlings’ creative output since then has been wide-ranging, multidisciplinary and seemingly-constant—something suggested through her 2016 interview over at Touch the Donkey—and a process not necessarily limited to the published book, but one that moves through performance, dance, visuals and text. 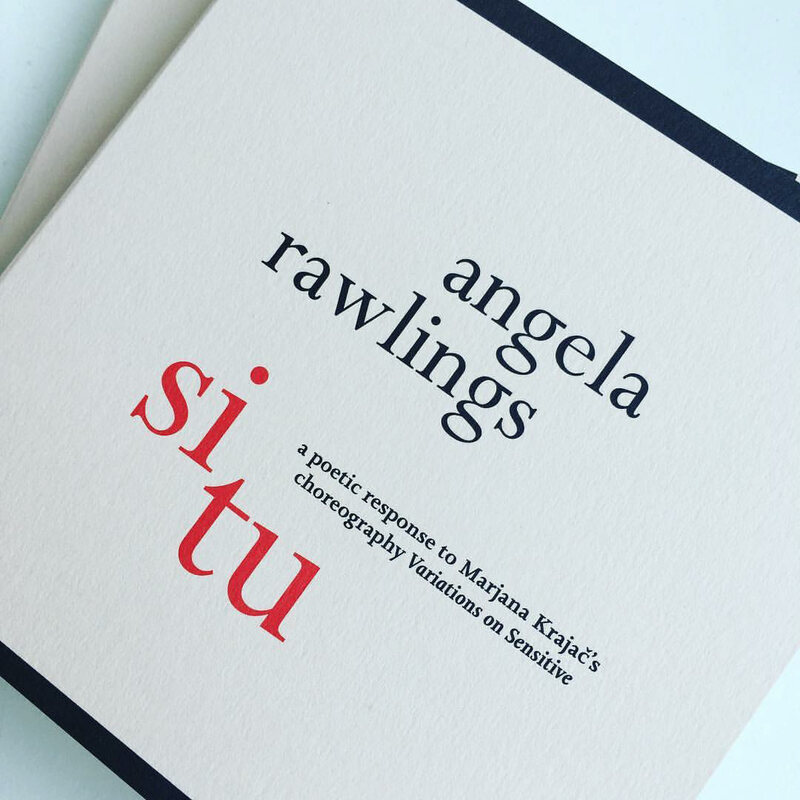 rawlings’ si tu is reminiscent, slightly, of Chicago poet Carrie Olivia Adams’ collaborative GRAPPLE (above/ground press, 2016), a work that engaged dance with the lyric, yet rawlings’ response is one far more attuned to the visual materials of text on a page, and how sound and motion are expressed in the space of two dimensions, coming to her response not through the lyric, but through a far more experimental and multidisciplinary sense of how the building blocks of visual language can be applied. I’m fascinated by rawlings’ approach in responding to a work I haven’t seen (which can provide its own benefit, not allowing the comparison to her source as distraction), yet able to grasp a sense of Krajač’s choreography as rawlings moves through description, sound and motion, writing fragments and sentences up against space, as words are reworked, transposed and translated, flipped, scattered and structured on a grid. “To put the mouth on. / To put the mouth on it. / To put the mouth on iz. // But as professionals, one / is not always so worried / about the safety of / professionelles.” Really, the performative element of sound and motion in this text is key, one that allows even the most casual reader to be present in this work as performance.